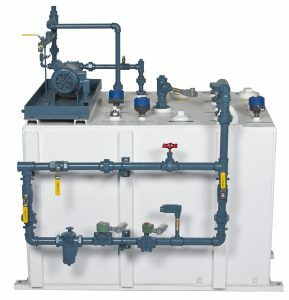 Critical Fuel Systems can supply several types of day tanks for your system. The typical configuration is a double wall tank with a closed interstitial space for leak monitoring. A second configuration is an open top rupture basin where the leak space is open. A third configuration is just a single wall day tank which may be installed in a containment dike area. These day tanks are either UL142 or UL2085 tested and designed. They range in size from 60 gallons to 600 gallons but larger units can be provided. Each tank is custom designed to fit the requirements of the application. This includes custom dimensions and special connections on the top of the tank. Control requirements at day tanks can include simple sensors only, but may include a control panel with a touch screen operator interface. Communication to the pump set control panel or master panel can be handled with dedicated hard wires or a communication link. CFS Overview Brochure Provides a complete review of all the components that make up a system. Day Tank Brochure Provides an overview of day tanks. Every system has special requirements – we look forward to helping and would love to hear from you.